Looking for an easy-care spring-blooming shrub that supplies year-round beauty? Take a look at Japanese Pieris this season – you won’t be disappointed! 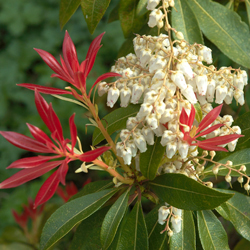 Pieris japonica is an upright evergreen shrub with spreading branches. It has the potential to grow 6-8 feet high and 4-6 feet wide. This is an easy to care for four-season plant that can be a stunner in the yard throughout the year. Except when they emerge in early spring with a bronzy hue, the leaves of the Pieris are lance-shaped and glossy deep-green throughout the year. The flowers appear in April and last well into May. 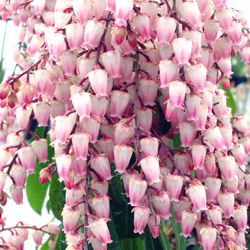 The urn-shaped blooms, like those of lily-of-the-valley, hang in heavy, drooping, pendulous clusters that are 3-6 inches long. The fruit is ornamental and will persist through the winter, but it is best to remove the fruit so that the plant will put its energy into developing next year’s flowers. Not as fussy as other ericaceous plants like heath and heather, Pieris prefers a moist, well-drained, acidic soil with a pH in the range of 5.0-6.0. When planting, amend soil with plenty of peat moss; this will aid in drainage and help make the soil more acidic. Organic matter like compost should be added to compacted soil to increase drainage and should also be added to sandy soil to enhance water retaining capability. Sulfur may be added to the soil to lower the pH if it is too high. After planting, mulch the soil around the base of the plant with two inches of bark mulch, making sure to keep it from touching the trunk of the shrub. Pine bark mulch is a good choice when mulching Pieris because it will acidify the soil as it decomposes. Pieris likes a semi-shady location and will flower best in areas where it receives some sun during the day. Protect all broadleaf evergreens from the prevailing winter winds. If this is not possible, spray them in the winter with Wilt-Pruf, an anti-desiccant, to prevent winter burn. 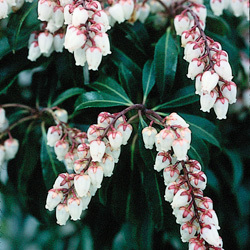 Pieris must be watered frequently during the first year after planting to encourage root growth. The addition of a root stimulator at planting time will encourage the plant to quickly create deep, strong roots. After becoming established, Pieris is relatively drought tolerant but does, of course, grow best with consistent adequate moisture and regular fertilization. Pruning Pieris is usually not required. When purchasing, know the ultimate size of the cultivar you desire so that you may choose a suitable location in your landscape where the plant may grow to its full potential. If pruning is necessary, prune immediately after flowering so as not to interfere with the formation of next season’s buds. 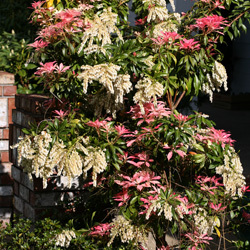 Pieris mixes well with shade-loving plants that require acidic soils such as azaleas and rhododendrons. Highly diversified in its design use, Pieris works well in a Japanese garden, woodland setting, shrub border, foundation or even a mass planting. The smaller varieties look great in containers and rock gardens. Pieris is deer-resistant as well, making it a great border or screen for other plants. We have a great collection of Pieris cultivars to satisfy the novice as well as the discriminating connoisseur. Consider the following varieties, or come in to see the latest Pieris types and let us help you choose the best one for your landscape. ‘Brookside’ – New growth is chartreuse. It has upright white flowers and a dwarf habit, maturing at only 1-2 feet tall. ‘Brower’s Beauty’ – Compact form, 4 feet wide by 6 feet high. This is a heavy bloomer with large trusses of white flowers in spring. ‘Cavatine’ – This is a low growing, compact mounding cultivar with white flowers that are held upright on the plant. This cultivar blooms slightly later than others. ‘Dorothy Wycoff’ – Compact form, 4 feet wide by 6 feet high. Dorothy has dark red buds opening to pale pink flowers. ‘Flaming Silver’ – Leaves emerge a brilliant red, turning green with a pink margin and finally becoming green with a silver-white edge. This cultivar matures at 6 feet wide by 6 feet high. ‘Forest Flame’ – Light pink leaves mixed among brilliant red appear after the plant has finished blooming in spring. Flowers are white. This Pieris grows 8-10 feet tall. ‘Mountain Fire’ – With its vivid fiery-red new growth, clean white flowers and a compact uniform growth habit, this Pieris has become increasingly popular in the last few years. ‘Mountain Fire’ matures at 4 feet high by 4 feet wide. ‘Prelude’ – This cultivar would make a wonderful addition to any rock garden. It is a dense mounding, low growing plant with red new growth that blooms slightly later than most other Pieris. ‘Valley Fire’ – The young growth on this vigorous grower is a brilliant red. This cultivar has white flowers that are larger than most other Pieris. ‘Valley Valentine’ – This Pieris has deep maroon flower buds on pendulous flower stems that open into deep rose-pink, long-lasting flower chains. It is a slow-growing cultivar with a compact mounding habit maturing at about 5 feet tall by 6 feet wide. ‘Variegata’ – Attractive leaves are green with white margins. Flowers gracefully droop in white clusters. This Pieris grows to 5 feet tall in the garden or landscape.